H.I.S. 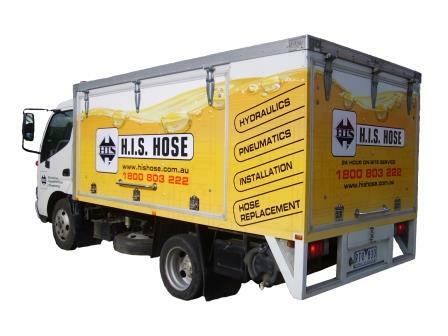 Hose Pty Ltd is a wholly owned and operated Victorian company which from humble beginnings in 1975 now operates from well stocked warehouses/showrooms located in the Melbourne suburbs of West Sunshine (Head Office), Dandenong and Campbellfield. It is now recognised as a market leader in the supply of industrial hose, fittings, flexible ducting and associated equipment including pneumatic and hydraulic hardware/components. Our satisfied clientele encompasses major and minor establishments in defence and other government departments, resources, agricultural, automotive, industrial, marine and manufacturing industries. The two founding Directors Russ Barty and Reg Roberts have both been involved in various facets of the industrial hose industry in Australia since 1967. All major administration is handled at Head Office including all accounts functions and majority of purchasing. Campbellfield and Dandenong Branches perform all other sales and service functions as Head Office. Availability of technical advice and access to Repairs/Service Hose Trucks and all stocked products.